Published: Oct. 11, 2011, 5:01 p.m., Last updated: Oct. 11, 2011, 9:11 p.m. This is a terrible situation. Companies selling the Tara KLamp are making money by inflicting injuries and suffering. The KZN government's adoption of the clamp is, in the best case scenario, deeply suspicious and unscientific. We did not have evidence of corruption and so left matters at that. 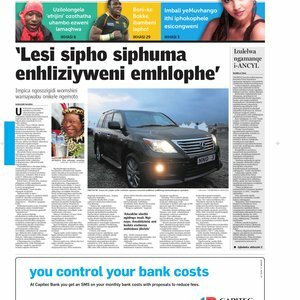 On 18 September the Zulu edition of the Sunday Times newspaper reported that a businessman, Ibrahim Yusuf, had given King Goodwill Zwelithini a car worth R1 million. According to our translation, Yusuf said that he had given the king the car as a symbol of respect and that he had not met the King before their meeting at the reed ceremony. Yusuf is the director of Intratrek Properties, the company that sold the Tara Klamp devices to the KZN government. The Mail & Guardian has written about Yusuf’s murky past here and here. What we have explained to the Minister and now indirectly to you is that we are committed to massive Medical Male Circumcision in KZN as directed by His Majesty our King. We will do it medically as the Majesty instructed us. The king has instructed us that no one should die as a result of our MMC intervention but he did not instruct us that no one should have pain. We found this response disturbing for many reasons, not least because an elected provincial government is not supposed to take orders from a traditional leader. But it is also strange that when confronted about the clamp, the MEC chose to invoke the king – thus raising the question, was the king involved with the decision to use the clamp in the first place? The manner in which these devices were purchased was suspicious long before the story of Yusuf’s gift to the king came to light. (See this Mail & Guardian report.) For example, there was no tender advertised for the Tara KLamp. Yet TAC had purchased a Tara KLamp from another provider at a lower price than the KZN paid for its bulk orders. Even though we requested it, we were never shown the justification for purchasing the Tara KLamp – which is both more expensive and, more importantly, much riskier than standard circumcision. When TAC wrote to the KZN Health Ministry in July 2010 we outlined our concerns with the use of the Tara KLamp. In their response, and in a subsequent meeting with the KZN premier and Health Department officials in late 2010 they dismissed our concerns. This was despite us presenting two men who had experienced serious adverse events to the meeting. We also published cell phone video footage of two other men who had experienced serious adverse events due to the clamp. We have recently learned of more men who have experienced severe adverse events, some of whom had to be hospitalised. At our December meeting Premier Mkhize indicated that the KZN Department of Health was going to assess the safety and efficacy of the Tara KLamp and that future use would be dependent on this. We pointed out in the meeting that this was a problem. If this was operational research it would be unethical because a clinical trial had shown the device was dangerous and therefore it should not be used operationally. Alternatively, if this was a clinical trial, then ethical approval was necessary and this was unlikely to be given after the clamp had failed in a well conducted clinical trial in Orange Farm. No one in the meeting could tell us whether the intended research was a clinical trial or operational. TAC wrote a letter to Premier Mkhize asking for further details of the KZN government's research. There was no response. That no trial has taken place or will take place is confirmed by a presentation that Tim Farley, until recently of the World Health Organization, delivered at the International AIDS Society Conference in Rome earlier this year. According to the slides from his presentation, no further trials are planned. The national government also set up a task team, with WHO assistance, to look into the Tara KLamp. Nothing seems to have come of it. In a September 2011 report from the KZN Department of Health the only mention made of the Tara KLamp is to argue that it is cheaper than standard circumcision. The price breakdown given lacks detail and so we cannot analyse it. A circumcision expert told us plainly it's "crap". In our earlier article we gave a detailed breakdown of the cost involved and the clamp was significantly more expensive. Health Minister Aaron Motsoaledi assured the public last year that the clamp would only be used in KZN. We are worried however because we have been informed that the Tara KLamp is being promoted to representatives of various other provinces. Voluntary medical male circumcision is an important intervention that can prevent many new HIV infections. It is tragic that the sellers of the Tara KLamp along with members of the KZN government are undermining it by continuing to use this dangerous device. There needs to be an inquiry into why and how the KZN government purchased it. It is puzzling that this story has been reported only in the Zulu edition of the Sunday Times. We have emailed people at the paper, including the editor Ray Hartley, to find out why it was not published in the English edition. The Zulu edition of the Sunday Times has a comparatively small readership to the English one. We have received no response. We understand that there may be various editorial or deadline-related reasons why things happen in certain ways at newspapers. However, by being in possession of important information and withholding it from its main publication we feel the Sunday Times has let down its readers and failed to act in the public interest. We urge the Sunday Times to publish the article in its English edition.